Diving into the study of Luganda, I have been struck by the many ways in which cultural learning is embedded in language learning, and vice versa. This is a theme that has also come up a lot in our coursework. Since we are always using a language to gain access to a particular culture, of course it makes sense that we'll be learning more about that culture through language learning. And, it makes sense that a better understanding of the culture will help us become better learners of the language. Examples abound for me with Luganda. During my very first weeks of study, when I was just doing basic greetings, a common interaction to find in written descriptions of greetings was this exchange: "Mmmm." Indeed, during my first session with my language mentor, I was taught when to insert an appropriate "Mmmm." Having lived in Uganda, I picked up an implicit understanding of what "mmmm" means, and how to sprinkle it into speech. However, I was surprised (and, to be honest, tickled!) that this form of communication had made its way into my more formal learning. 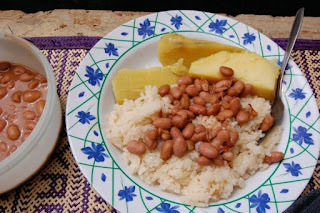 This signifies to me that "mmmm" is much more central to Luganda than I'd given it credit for prior to language study. In class, I know I have gone on at length about the importance of greetings in Ugandan culture. But for the benefit of any blog readers, it needs to be said: greetings in Luganda are foundational. There are many types of greetings, greetings for people of different statuses, greetings for different times of day, etc. To have a grasp of the full range of greetings is critical in order to navigate respectfully within the culture. So, it should surprise no one that one of the first verbs I learned was the verb for "to greet" (okulamuza). And, when working on verb conjugation with my mentor last Friday, he had me do an exercise where you describe your morning's activities (get up, brush teeth, eat breakfast, go to work, etc.). What did I learn was the second activity a person's supposed to do in their morning routine? Greet their spouse. Of course! The power of greetings strikes again. Finally, bits and pieces of figures of speech have come through my study so far. The one that stands out to me the most is Emmere eno enemye, which means "I"m full," but translates literally to "This food beats me." Living in Uganda, I was often given heaping plates worth of food that I was never able to finish no matter how hard I tried. So, this expression resonates quite a bit to me! I felt like I was constantly being beaten by the sheer quantity of food. Learning this little cultural expression is not only fascinating, but I believe I will remember the phrase more easily, since I have a personal connection to it. When I use the phrase, I'll also be demonstrating cultural competence. In terms of my week this week, it's been fairly middle of the road. I had another intense, but beneficial, session with my mentor. I learned a lot and have been spending the time since then trying to fully grasp some of the grammar and concepts that we went over. One thing I want to be doing more of is the speaking aloud sentence practice that I'd earlier committed to doing. Since I have been studying all over campus this week, and not quite as much in the privacy of my own home, this has been difficult to achieve. I am feeling like my speaking skills are not growing as much as a result. In the coming week, then, this will be a priority for me. What's working: Mentorship and Omuzanyo!